Good home theater doesn't have to cost much. The Viewsonic Pro8200 is a 1080p projector that costs less than $1,000 from authorized resellers. Its 2,000 lumen maximum brightness makes it quite versatile, able to project in the theater or the living room equally well. A 1.5:1 manual zoom lens allows easy placement in many rooms, while a pair of HDMI ports and dual 10W speakers create opportunities to use the Pro8200 as a mobile theater in itself, free of fixed installations and A/V receivers. Low-cost replacement lamps, a 6,000 hour maximum lamp life, and a three-year warranty ensure affordability. The Pro8200, while easy on the budget, is a capable home theater projector suitable for theater/film viewing or Sunday afternoon football. The Pro8200 has high brightness and moderate contrast, at 2000 lumens and 4000:1. It has a longer than average zoom range, at 1.5:1, but no lens shift. These features make the Pro8200 flexible when it comes to installation and viewing environment. The high brightness could allow easy use in a well-lit living room at diagonal sizes up to 50" or 60", essentially serving as a replacement for a flatscreen TV. Placement on a coffee table would minimize hassle and expense, and at 8.5 pounds the projector is actually quite portable as well. It even comes with its own carrying case. With dual 10W speakers, one could use the Pro8200 as a mobile video projector, perfect for game day at a friend's house. On the other hand, lumen output can also be reduced somewhat, allowing use in a home theater with good light control. While black level is not as deep as some other competitive models, with some adjustment it can create very respectable shadow detail. Dark Room, a more color-balanced operating mode than the default Brightest mode, still puts out up to 1475 lumens. This lets you light up very large screens up to 150" diagonal, though the Pro8200 looks its best on a smaller screen around 120" diagonal. All of the included operating modes are somewhat cool in color temperature, with even the most accurate measuring around 7500K at its defaults. The projector can be dialed in quite a bit closer to the ideal 6500K grayscale, 2.2 gamma, and Rec. 709 color space without much effort. In our case, the 'quick-and-dirty' color temperature settings entailed raising Red up to 60, leaving Green at 50, and bringing Blue down to 40. This brings you closer to the 6500K standard without necessitating a meter or an expensive professional calibration. In a light-controlled theater setting, a ceiling mount is the preferred set up to minimize fan noise and heat exhaust from the projector. The lens has a throw angle offset of 33%. That means if you ceiling mount it, the top edge of a 100" diagonal picture will appear about 16" below the centerline of the lens. The picture itself will be about 4 feet in height. So with the ceiling mount clearance added in, the picture would be just about centered vertically on an 8 foot wall, with two feet below the picture and two feet above. If you want to go much larger than a 100" diagonal image, a room with a higher ceiling would be desirable. Does the Viewsonic support 2.35:1 format with a switch of a button like the Mitsubishi does? Obviously the huge increase in brightness is in preparation for next generation of 3D models. Also a brighter picture always makes it easier to see the digital switching of the DLP micro mirrors. 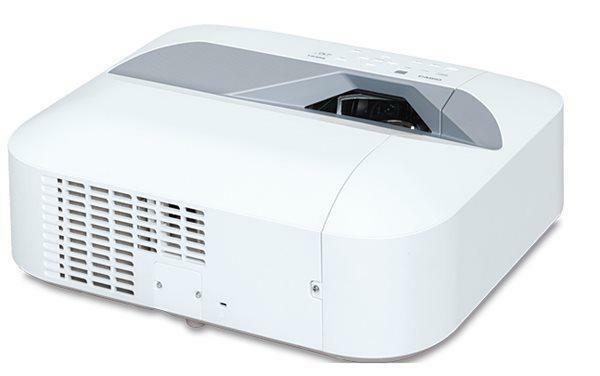 With the exception of the on-board speakers, how does this projector compare to the Optoma hd20? I just bought this projector and I've noticed an excessive amount of horizontal screen tearing. Is this just because I'm running 32bit windows xp? I don't see it in game but it's hard to miss on netflix or other streaming videos. I notice the same thing using a WD TV Live . on initial boot, the splash screen is 720 and it resets again at 1080p and the latter seems dimmer. Odd.